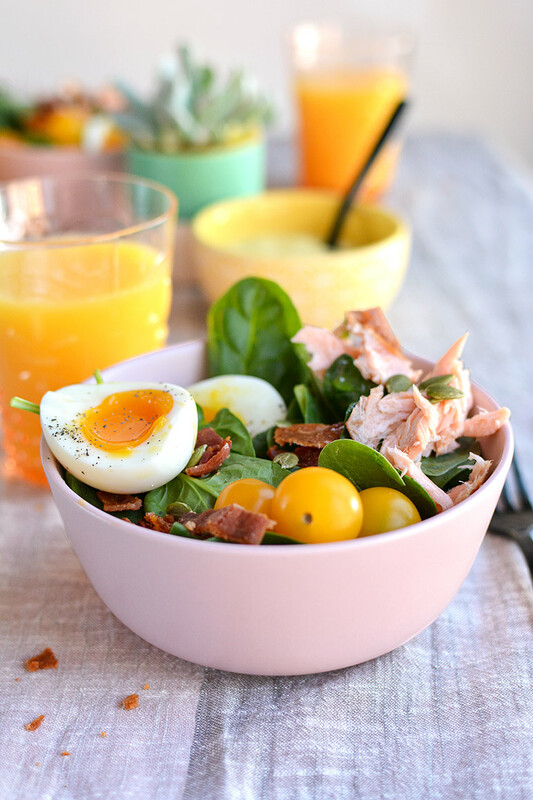 This Spring Cobb Salad is loaded with alllllllllll the good stuff: delicious smoked salmon, golden cherry tomatoes, soft boiled eggs (ie. perfection), pumpkin seeds, avocado, and bacon. 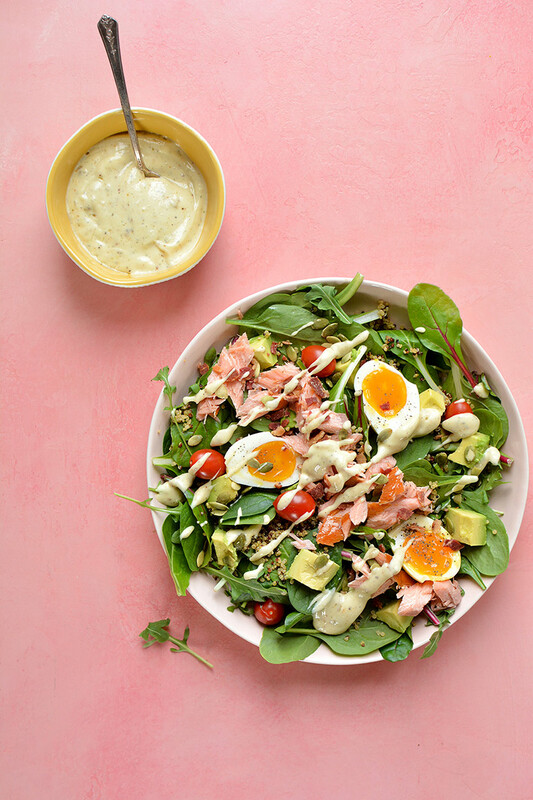 Then it's topped with a powerhouse dressing made with Vital Proteins collagen peptides, olive oil, lemon juice, and a few other things. 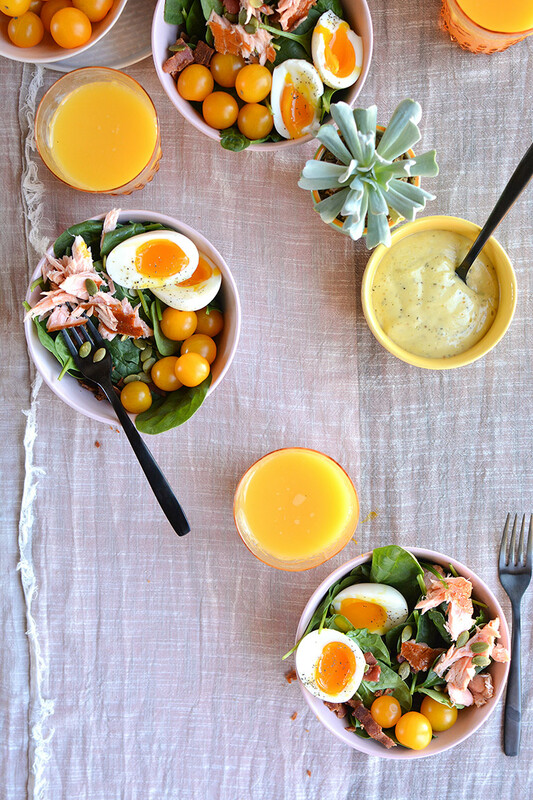 I have been eating this salad on repeat the past month and a half --- and even doubled the recipe to bring to Easter brunch as a side dish. It's that good. It could totally pass as a "breakfast salad" (did you know that's a thing???) and most definitely a hearty brunch salad with OJ or mimosas (as shown below). Or have it for lunch... or dinner. It's delish ANY time of day!! So, the last time I shared a Vital Proteins' collagen peptides recipe with you (remember this fancy ramen noodle bowl? ), I talked about how I love collagen as a protein powder -- 18g per serving (woot woot!!) and how awesome it is that you can stir them into hot OR cold liquids. But today I want to share another super health benefit of taking daily collagen peptides. They are packed with 18 amino acids that are great for gut health. You know, your tummy! They help you better digest your food and help support the lining of your intestinal tract. 1) Use Vital Proteins Collagen Peptides. 2) Eat 2 tbsp of fermented foods. (Think kraut, kimchi, other pickled veggies). This smoked jalepeno one is my favvvv with a dollop of guac. 3) Drink 1 tbsp of ACV (apple cider vinegar) with water each morning. This salad is totally customizable. Only have red grape tomatoes? No problem. Want to add quinoa for more plant-based protein? Sounds good. Don't have any pepitas? Fine... maybe sub sunflower seeds or pistachios! Have mixed greens in the fridge instead of spinach? Perfect. So what are you waiting for? 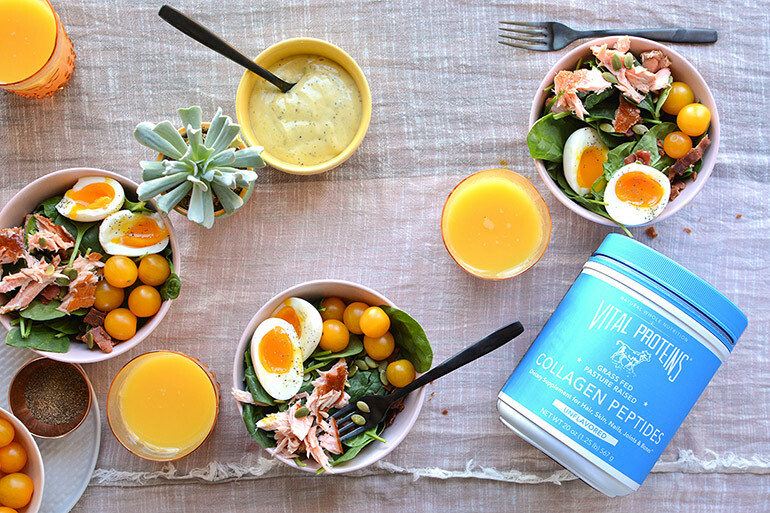 Get your hands on some Vital Proteins' Collagen Peptides, stat! --------------------------------------------------------------------------------------------------------------------------------------- This is a sponsored conversation written by me on behalf of Vital Proteins. The opinions, recipe, beautiful food photography and text are all mine. Thank you for supporting brands that support Nosh and Nourish!! I choose them based on what I already cook/create with and feel 100% confident in recommending to you. *How to soft boil eggs ---> bring small pot to full rolling boil. Add in eggs and let boil on high for 8 minutes. Then remove eggs and put them in an ice bath (fill small bowl with ice, then cold water). Peel and slice for salad. Assemble your salads in individual bowls: greens, 1/2 cup quinoa, 1/2 an avocado, 4-6oz smoked salmon, bacon crumbles, tomatoes, and pumpkin seeds. The dressing can stay in an air-tight container in the fridge for up to a week.